There are two ways to make felt. Either by needle or the wet method. To make a needle felted piece you need a background piece of fabric, a felting mat, a felting needle and your roving. A roving is a long and narrow bundle of fiber. Rovings are produced during the process of making spun yarn from wool fleece, raw cotton, or other fibers. Their main use is as fiber prepared for spinning, but they are great for needle felting. There are also felting machines on the market. I think you would have to do an awful lot of felting to put that much money into it. Wet felting is the process of combining roving into a flat piece of cloth. There are many instructional videos online if you are interested in trying this process. 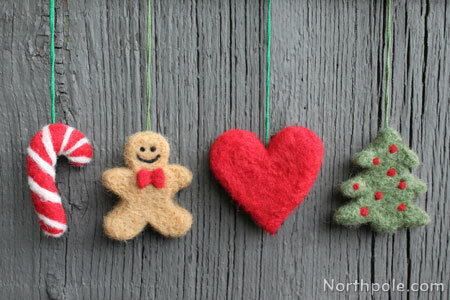 If you follow the link below in the picture, you will find a great tutorial for easy felted ornaments. This is great for a beginner. I must admit I have never felted anything. But it does look like it might be fun to do. I may give it a try.